South Dakota employed 6,300 certified nursing assistants in May 2013 which signifies that employment per 1,000 jobs was 15.63. As per the indeed.com, in January 2015, CNAs in SD earned 25 percent lower than the national average salary. Their mean yearly wages were $18,000. Although, the annual salaries of CNAs is not much in SD, but the standard of living is quite low in the state. The Bureau of Labor Statistics reported the annual mean wages and median hourly pay as $23,250 and $11.18 respectively. This profession, no doubt, is challenging and requires complete dedication nevertheless this career option is the best stepping stone to enter the medical field. 90% of CNAs were offered an annual salary less than $29,700; 10% were paid more than $29,700. 75% of certified nurse assistants earned an income less than $26,110; remaining 25% earned more than $26,110. 50% of the employees received less than $22,680; rest 50% earned more than $22,680. 25% of CNAs were paid annual wages less than $20,380; 75% were paid more than $20,380. 10% of employees were salaried less than $17,990; 90% were salaried more than $17,990. 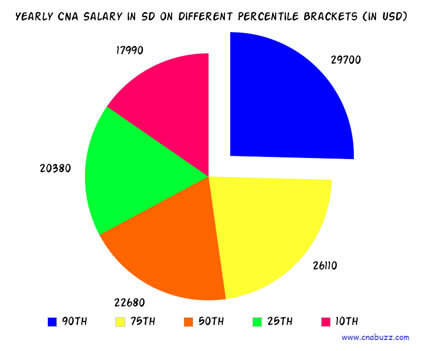 A number of factors including the area where a CNA works affect his/her salary. In South Dakota, certified nursing assistants earned the maximum income of $28,021 in Rapid City. On the contrary, Aberdeen paid the lowest annual salary $17,765 to the nurse aides. The reports provided by the Bureau of Labor Statistics suggest that the demand for nursing aides will increase with the growing elderly population. Additionally, the rising admissions to the nursing home facilities will result into more job vacancies. Seeing the tremendous demand of CNAs, the BLS has projected the job outlook of these professionals to be excellent. Those who have keen interest and the right aptitude for this field will definitely enjoy a bright future. Question 1 – I have 4 years of working experience as a CNA in Colorado, but I’m planning to move to South Dakota. How much yearly income can I expect in SD? Answer – All CNAs can expect an average annual income of $18,000 in the state of South Dakota. 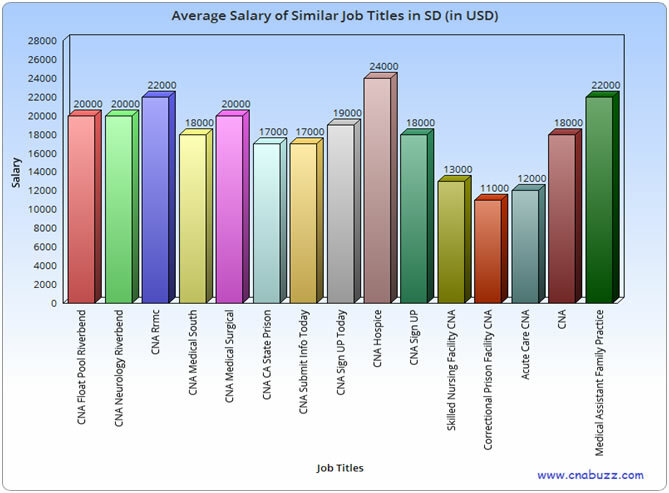 Question 2 – Can anyone suggest me some highest paid CNA job titles along with their annual salary in the state? Answer – In SD, CNA Hospices are the top paid job title earning a salary of $24,000 per annum. Other top paid job titles are Medical Assistant Family Practice ($22,000), CNA Medical Surgical ($20,000), CNA Rrmc ($22,000), CNA Float Pool Riverbend ($20,000), and CNA Neurology Riverbend ($20,000).